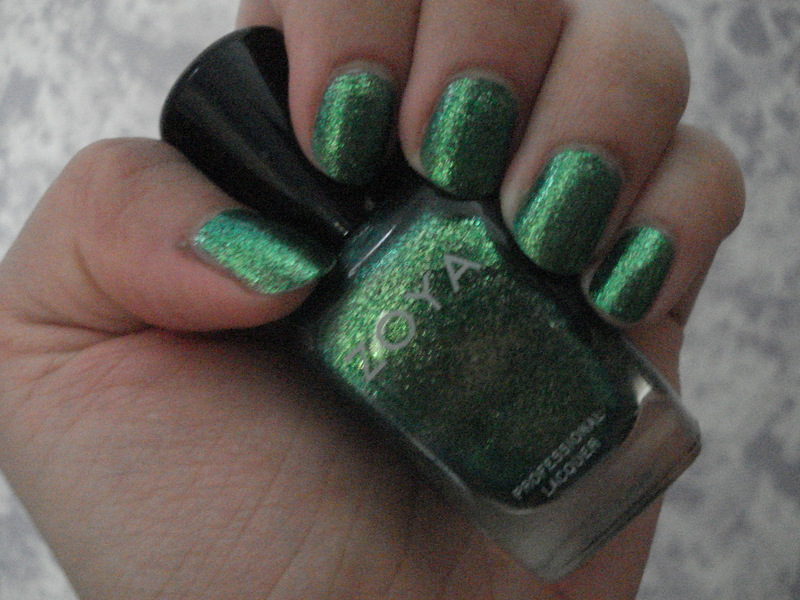 Zoya Ivanka – is a true mid-tone green sparkle nail polish. Before I begin this review – lets just take a moment to soak this baby in!!! It is GORGEOUS!!!!! This polish came out in Zoya Sparkle 2010 Summer collection and it is one of my absolute favourite Zoya nail polishes EVER!! If you are a green nail polish lover – don’t walk – RUN to your computer and ORDER this polish ASAP!! I had to show two pictures of this beauty because the flash was washing out the gorgeous green + silver sparkle in this polish – but just look at it, isn’t she a beauty??!!! I have said this before, it reminds me of the colour of money, which makes me wonder about the name sake = Ivanka? as in Ivanka Trump? who knows lol. You need 3 thin coats to achieve the full spectrum of beauty for this polish but it is really really worth it and the thin coats does dry quickly! I wore this on St. Patricks Day and needless to say it was the PERFECT polish for that occasion. You really have to see it in person to capture the pure beauty of it but I assure you, you will never find a dupe of this polish – there is NOTHING like it out there on the market. So don’t waste time – order it! As a final note, I love the way it pops an outfit and when it is paired with a pink lip + black winged eye liner! Do you own Zoya Ivanka? What are your thoughts on this nail polish?